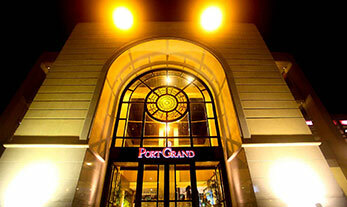 The identity of Port Grand. 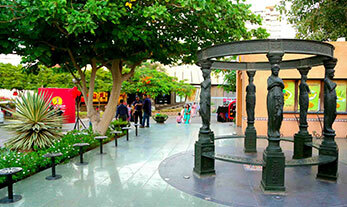 A purpose built structure that houses eateries and shopping outlets. Serves as a reminder of our diverse history and culture where all faiths resided peacefully. 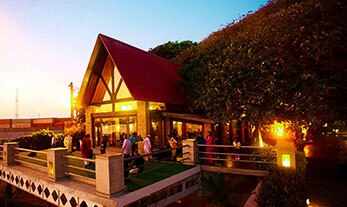 Napier’s Tavern at Port Grand is built to showcase the historic architecture and is exclusive for events only. This cathedral style gothic building is right under a 150-year-old Banyan Tree where Charles Napier ordered the construction of the jetty. The stone and wood extracted from the original jetty now constitute the sole construction extracts of this building. The promenade, built along the waterfront of the 19th century Native Jetty Bridge, houses over 20 different eateries & restaurants overlooking the busy Port of Karachi, which is dotted with urban street furniture in nautical style and Victorian lampposts throughout the 1800 feet long reconstructed bridge. 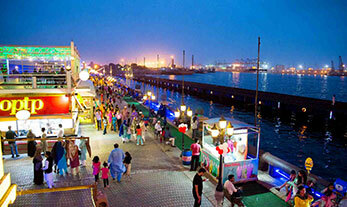 Rotary is divided into two categories, The Festival Boulevard and the Fun Gulee. 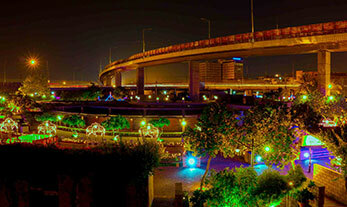 The Festival Boulevard, surrounded by the imposing M.A Jinnah flyover, is a beautiful landscape radiating a terraced structure and a Pedestrian Street with numerous streetside shops and beautiful fountains forming a unique space of leisure and entertainment. Fun Gulee is a registered service brand of Port Grand and is the area which offers family based attractions, recreational and entertainment activities for kids and adults.